All photos by Joe Ortega. This interview previously aired on idobi Radio and is for everyone who was too lazy to tune in. Enjoy! 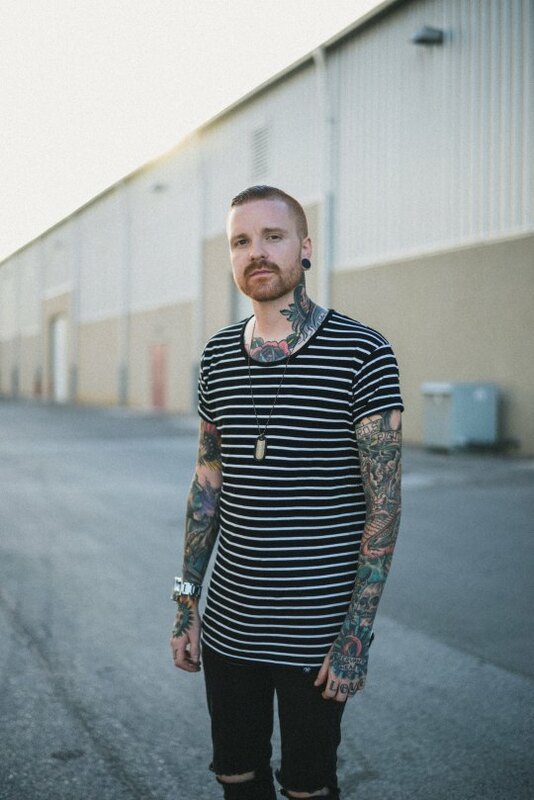 Matty Mullins is a bit of an anomaly when you think of loud in-your-face metalcore music. 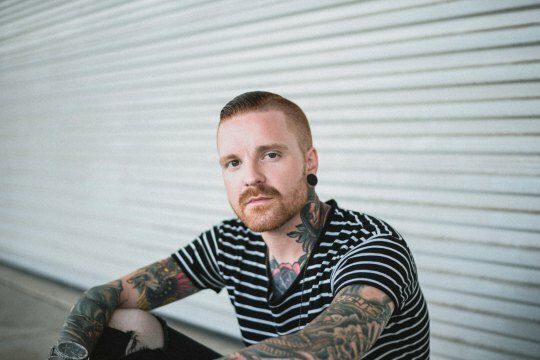 The soft-spoken, well-mannered musician – who constantly wears a smile on his face and isn’t afraid to talk to anybody about his faith – is approaching his tenth year in the influential scene staples Memphis May Fire. Known for his top-notch vocal range and impeccable stage presence, Mullins is gearing up to release his band’s long-awaited sixth full-length LP Broken which is due out November 16th. Discussing what to expect on the new record as well his excitement to tour with the likes of Atreyu later this year – oh and not to mention, his newfound passion for country music – the constantly grinning and always positive Mullins gave us the low down right before he hit the stage for his first ever “DJ” gig at Arizona’s emo night-like event Riot Night. 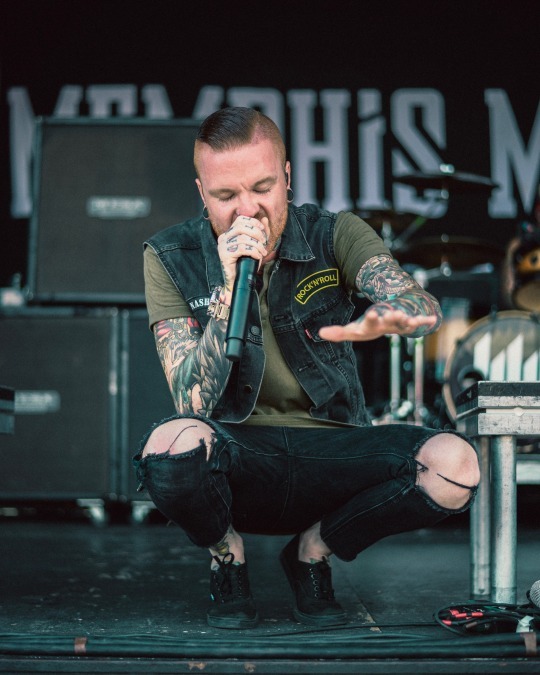 To check out what Mullins had to say about what should be a very big next few months for Memphis May Fire, be sure to look below. To grab tickets to see the band out on tour with Atreyu, Ice Nine Kills and Sleep Signals, head here. 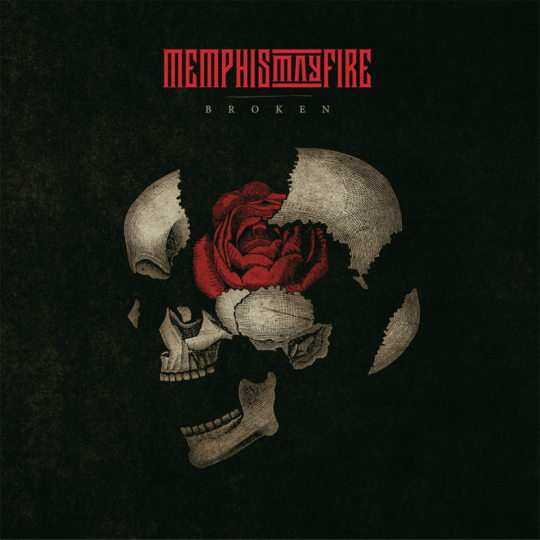 Afterward, make sure to pre-order Broken here. 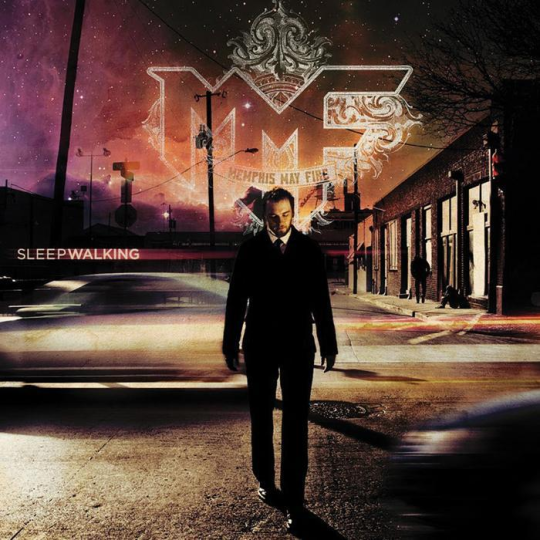 Memphis May Fire has been kind of been hiding under the radar for a while now. What have you guys been up to for the last year or so? So, we did a new record, and the hope was to put it out over six months ago. We did the record and it would’ve been about a year ago from now. But when we finished the record, we decided to send it out to someone else then we originally had in mind for mixing. And when we did that, I decided to fly out the other guy that mixed it – the guy that mixed our album, his name is Drew Fulk, he lives in LA. So I decided to go out and touch up a few vocal things with him and then we got final mixes back, maybe two days into that Sevendust tour that we did. So, since we were already into that tour, we couldn’t rush it out quick enough. So then, between then and now, we’ve just been waiting for the right tour to drop the record on and going out with Atreyu in November, that’s when we’re going to drop the record, for sure. Nice! Are you guys going to be playing any new music on the tour? Would you say that “Virus” is a pretty good sign of what’s to come with the new record? The new record is definitely more of a rock record than anything we’ve ever done before. “Virus” was way out there compared to the other stuff that we’ve done. I would say this is a nice middle ground of it. It’s a Memphis May Fire record through and through, but we were really just focused on songwriting. I mean the songs were more important than, you know, trying to get a breakdown in that we thought people would chant or whatever. It was just like, can we make ten great songs that we’re really proud of that will withstand the test of time? That’s kind of the idea with the record and I believe we did man, and I’m really excited about it. So then what was the writing process like? It sounds like you guys obviously took your time and didn’t rush it. I mean every record that we’ve ever done has had kind of a rushed vibe to it. I mean, we’ve always been like “Alright, here’s our one chunk of time to do this record, let’s get in and do it. Knock it out and be done.” And with this record, we spent two months out in Vegas doing the record, writing the record. This is the first time that we haven’t gone to the studio with finished songs. We purposely went to the studio with nothing but just a few riffs and wrote the record from the ground up in Vegas. That’s the first time that we’ve ever done that. Why do you think all the other records were rushed so much? Do you think it was just how the industry is these days, you just have to get stuff out constantly? You know, it is always going to be like that. I mean, you know when we were younger and touring and just like starting to build our reputation, it was like, we had to get a record done in a really short period of time so we could get right back out on the road. Every show counted, you know? 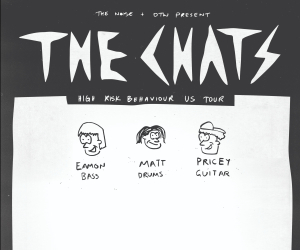 Every tour that we could get on, we were jumping on anything and everything we could do. These days, we tour a lot smarter. We take touring opportunities that make sense in a lot of different ways but mainly stuff that we’re just really excited to do. You know what I mean? We don’t want to tour with the same bands over and over again for the rest of our career. We want to go out and do tours with bands that people wouldn’t even expect us with. I mean, dude, we did a co-headliner with Yellowcard I think that’s so cool! It doesn’t matter what the industry had to say about it or from an outsider perspective. That show, I feel like our fans and Yellowcard’s fans had such an amazing time just because it was outside the pocket of what people usually do. And then we did that Sevendust tour just recently, which I am so excited about. That’s Kellen’s all-time favorite band. So touring with those dudes, I mean they are seasoned, straight up real rockstars. They’re the real deal, have played arenas, sold out arenas. Those guys are it. They are the most humble, down to earth, just amazing human beings. It was such a cool tour to do and their fan base is way older than ours so we got to play in front of people who might not have ever even heard of our name. So that was awesome and then we are now doing this tour with Atreyu, obviously [we’ve] never toured with them before. I worked at Hot Topic when I was sixteen and that was the first thing I ever bought from Hot Topic – Atreyu’s The Cursed hoodie. It’s just really cool man, we’re trying to do tours that are really meaningful for us. I think what we’ve done so far is exactly what we’ve wanted to do. When you get to a certain point in your band, you’ve got to be smarter about touring. Every Time I Die, for example, just played shows with Fall Out Boy. There are so many bands that would’ve turned that down like “that’s not cool” but if you want to make it, you’ve got to take advantage of opportunities like that. First of all, that’s so cool! That’s awesome! Fall Out Boy is legendary, I mean that’s awesome. And Every Time I Die is smart, they tour really hard [and] they’ve been doing it a long time. For us, you know, I just turned thirty. Most of the guys in the band, we’re in our thirties now and it’s just like we don’t want to just go out and do cash grabs or go out and do tours like “Oh, the same tour we’ve done five times.” All of the bands we’ve toured with we love and respect so much, but we want to give our fans a genuinely different experience every time we’re out on the road. If that means us going out and supporting bands that we loved growing up or bands we’ve never toured with or no one’s ever brought up to us that we should tour with, that’s awesome to me. It’s creating something different. Speaking of those kinds of tours, certain artists look at these different ways, but anniversary tours. Next year is going to be ten years of Sleepwalking. Is that something that you guys would think about celebrating with a tour? I’m not going to sugarcoat it, dude. I mean, that record wasn’t our breakout record. You know what I mean? I feel like a lot of bands do ten years off records that were breakout records or records that people got attached too. When we play a room and there’s a thousand people in it, I would say fifteen of them know Sleepwalking songs. It was such a weird transition for us. That record had already been written instrumentally and then I came in and wrote vocals. That’s when we figured out, “Hey, this band being super southern rock isn’t going to work with this super northern kid singing for it from Spokane, Washington” [laughs]. From there we started to move into what became actual Memphis May Fire. Nothing against Sleepwalking, I’m really proud of that record still, but we [made the] Between the Lies EP and then from there we did The Hollow and that’s when we really figured out who we were as a band. So, if we were ever going to do a ten year [tour], it’d probably be for The Hollow. Is it kind of crazy to think you’ve been in Memphis May Fire for almost ten years now? Sometimes it feels like it. Sometimes it doesn’t. I feel like I’ve grown up in this band which is weird, but yeah! You know, it’s crazy! Ten years! That’s a third of my life in the band. Sometimes it feels like I started yesterday and sometimes it feels like twenty years, you know [laughs]. It’s crazy. So tonight, you’re going to be DJing at Riot Night. How are your DJ skills? To be straight, super nervous! I’ve never done something like this before. This is the first time I’ve ever done it and I’ve always seen people do it and I’ve been like “Man, that’s awesome. I want to do that!” When I got the invite for it, I hopped on it like, “Absolutely!” But I’ve never stood on stage and sang someone else’s songs before or like sang along to someone else’s songs…maybe if I do, it’s a guest vocal. But I am terrified of karaoke. Being on stage without my band behind me, it makes me mad nervous dude. My band is my safety blanket, you know what I mean? I know that if I’m not having my greatest night, they’re picking up the slack. My band, the guys that I play music with, are the four most talented people that I know. It’s always an honor and it just feels so awesome to be on stage with those dudes. But just doing something by myself, I mean, I’m excited. It’ll be cool but I’m kind of nervous. Okay, so a couple more questions… this one is very important. The NFL season kicks off soon, how are you Seahawks going to do this year? Oh man, it’s so hard to tell dude. You can never really tell. And preseason doesn’t really show you anything. I’m really hoping, hoping for a big season dude [laughs]. But you never know, I mean we have had incredible years and we’ve had bad years. I mean, last season wasn’t bad. We took it as far as we could. I feel like there were some key players, that if they weren’t involved, we would have had a better season. But Russ[el Wilson] is the greatest quarterback of all time. He’s my dude, I’ve got my Seahawks jersey in my suitcase and I’m wearing it on my flight tomorrow to LA because I think I’m flying during the game. Hopefully, I’ll be able to catch a little bit of it or maybe try to stream it from the plane. I don’t know, I’m really excited though. To wrap this interview up, we want to take a song request from you – it can be any genre. What have you been listening to lately? Dude, here’s the thing: At the age I’m at right now, I listen to songwriting. It’s no longer like when I was younger and I wanted to feel rebellious and I wanted to get my anger out and stuff like that. Dude, I’ve been married for twelve years, I’m extremely happy. We’re settled down in Tennessee, everything is so chill. So, when I listen to music now, it’s not because of built up aggression – and there’s nothing wrong with that, that’s amazing. I think that using music as an emotional outlet is awesome. But in this season man, I just want to hear a song that was really well written from start to finish. I think the album of the year is Dan + Shay, that new record. I see the look on your face [laughs] like, “Are you serious?” But dude, front-to-back, all ten songs, bangers! And Cody, who plays guitar in Wage War, he just moved to Nashville and we’re good buddies now. All he loves is pop-country. So we’d go kayaking and just blast Dan + Shay and just listen to songwriting. I think Dan + Shay’s new record is incredible. Obviously “Tequila” is the big single on that record. Also, Ben Rector is an incredible songwriter. But yeah Dan + Shay, they come from this world of music. Before they got into country, their bass player is the bass player from My American Heart – which was like my favorite band growing up! – and their guitar player and drummer, I believe are from Rocket To The Moon. Their band, they came from our world and they were just like, “Man, we can write great country music, pop-country music” and I believe they wrote the record of the year. It’s a smash dude. Being in Nashville, it’s probably hard to get away from country music. It’s all around you. You don’t rock a pair of cowboy boots? I mean, I would rock a pair of cowboy boots all day long [laughs]. It’s just about songwriting, about the way that everything just flows together and intertwines to make something beautiful and makes you tingle. I think great songs is great storytelling. I think country does that well and great country does it really well. Has that impacted your writing for this record at all? Not country music, necessarily. It’s a rock record. But I mean, definitely just the desire to write great songs from start to finish is absolutely the mindset that we had for this record and the goal we went in with for this record.